Any diet plan that expects you to ignore your feelings of hunger will never work for long. Appetite is a critical survival mechanism regulated by your brain and digestive system. It is your body’s way of letting you know you need fuel for energy. When you go on extremely low calorie diets, such as the grapefruit diet or cabbage soup diet, you trigger a metabolic reaction that ends up making you fatter once you go back to normal eating habits. Here’s why… When you reduce your daily caloric intake below the level needed for daily energy for even a short period of time, you will lose weight. BUT your metabolism will respond as if you are starving and start storing fat very efficiently. Now you can’t stay on a starvation diet for very long. Eventually you return to normal eating habits – perhaps even eating less than you did before. But your metabolism is still storing fat at the starvation level. Not only will you quickly gain back what you lost, you will almost certainly pack on even more pounds than when you started. Remember – hunger is not your enemy. You should eat when you’re hungry. It’s just a question of how you satisfy your hunger. If you are overweight, it is probably not because you eat too much. It’s really all about the kind of foods you eat. Stop starving! Simply stick with low carbohydrate and reduced fat foods and watch the fat disappear. Before you tell yourself you’re hungry and need to eat, especially between meals or after dinner, make sure your hunger is real. You see, there is real hunger, the physical need for food, and there is emotional hunger, which is eating to fill a psychological need. The symptoms of “Physical Hunger” include a gurgling stomach, a gnawing feeling in stomach, an uncomfortable feeling in stomach. “Emotional Hunger” is eating in response to anger, anxiety, boredom, feelings of loneliness. Symptoms include hunger feelings in the chest, rather than the stomach, hunger in response to feeling nervousness or tension (fidgety feeling). You’ll it’s an emotional response when you don’t feel satisfied after an adequate meal or you find yourself opening the fridge or pantry and just checking it out to see what’s in there. Beware! The supermarket can disrupt your healthy diet and lure you into making bad diet decisions. Food manufacturers are experts at deceiving you into thinking their products are healthy and diet-friendly when in fact it’s just the opposite. Don’t buy foods with cartoons on the label for your children. 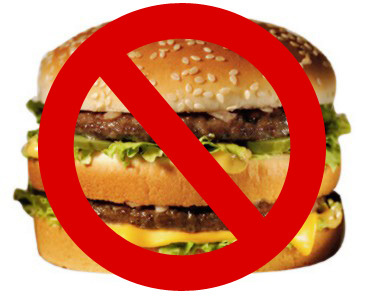 If you don't want your kids eating junk foods, don't keep it in your house. Avoid any food with five or more ingredients or ingredients you can't pronounce. If a food advertises itself as lite or lyte, you can bet it’s not light. Don't shop when you're hungry. Hunger leads to filling your cart with junk food. Don’t eat food that has been frozen or pre-cooked. Be wary of foods that come in cans or packages. Don’t eat food with ingredients that you can’t picture as food. Refined sugar can increase your risk of heart disease and stroke. Refined sugar can cause hyperactivity, anxiety, difficulty concentrating, and crankiness in children. Refined sugar leads to cancer of the ovaries. Refined sugar can weaken eyesight. Refined sugar can cause tooth decay. Refined sugar can contribute to arthritis. Refined sugar can cause gallstones. And how about this, dieters? Studies suggest sugar may be addictive! When someone tells you they need their “sugar fix” they really mean it. Research indicates that refined sugar depletes zinc in your body which dulls your sense of taste so you need more and more sugar to satisfy your craving for sweets. But refined sugar only one of many foods you should never eat. There are dozens of dangerous food components in hundreds of the foods you buy at the grocery store.